The giant Frieda River mine in West Sepik is now 60 percent ready of becoming a reality with the National Government waiting to issue the mining license for the project to start after few technical issues are sorted out, says Aitape Lumi MP and Minister for Treasury Patrick Pruaitch. "Frieda River is 60 per cent reality now, we are ready to issue the license. We just need to work through with the technical people to on how they will dump the raw waste." "The company has put an application to convert mine waste into power generation system , but the State does not have the capacity so it is doing its best to hire people to give the best advice on how we can look at that and we can give the okay for that 40 per cent to be completed, for 100 per cent to give the mining license for project to start," Mr Pruaitch said. Mr Pruaitch said this at the opening of the first ever Frieda Mine Landowners Forum underway in Port Moresby’s Crowne Plaza Hotel that started yesterday and will end today. Mr Pruaitch urged the people to work together and put together their benefits package for the National Government to consider during the project negotiation. 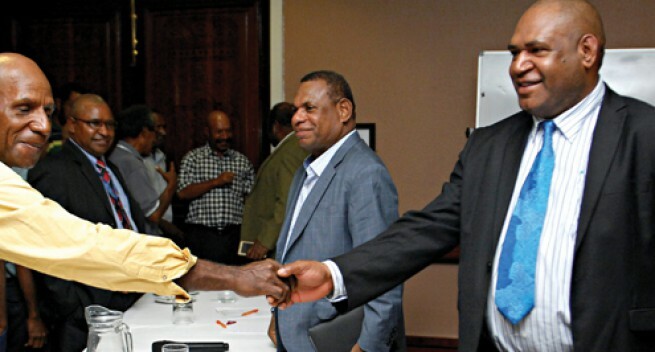 "I believe that is a big project that will transform Sandaun Province and Sepik region including Madang. This project will spread benefits across the region." "I want initial support from landowners because if we don’t have a project, we will not talk about benefits. We have to have a project, we have to get a leg in and another one in than we can be able to negotiate for the benefits. If we are not supporting the project than we can be standing here as leaders driving a lost cost, we must have a project, we must have shareholding understanding with impacted landowners, we must have understanding with the Telefomin district, we must have that understanding with the Telefomin LLG and sandaun Provincial Government."